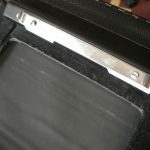 tobias feltus: créateur » Blog Archive » Graflex RB Super D: converting the back to take “standard” accessories. 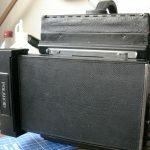 Graflex RB Super D: converting the back to take “standard” accessories. Finally, after a couple of years lusting after one, I have a Super D (thanks to Bob Crowley and his find). It is in very good condition, in fact, almost new, and hardly used if at all. The only issues were need for a bit of lube in the shutter, and some minor cosmetic issues (like the leather coming loose on the lens door, due to retraction). However the Graflex standard back is not too useful today, or at least, it is not much use to me, as I want to use some Polaroid, and a Grafmatic sheet loader. The normal approach to this adaptation seems to be along the lines of what Bob did with his, involving taking a Grafloc back, cutting it down, and gluing it into the RB’s back. But I saw little point in this as Grafloc backs are expensive, to me, and also there is little need for a springback on a reflex camera. the accessories do not have a light trap lip sticking out, but rather a recess in them. So, I had to shim the whole plane of the mount up by 1mm to create a groove to accept the light trap, and move in the tongue sliders. For most accessories they are fine the way that they come, however my Polaroid 545 back has two slots in either side, so I had to cut my sliders into the typical two-eared shape. I did this with a dremel and files. But from the start, clean everything up, and the edge of the tray needs filing back by about 1mm so that it sits flush with the new raised level. 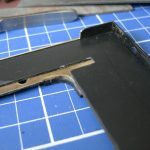 I then cut a piece of 1mm black styrene that I had to fit, and cut out the slot for the light trap. Then I glued this in with contact adhesive. The component has no structural value nor requirements. 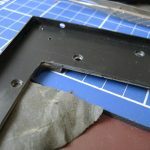 Then I drilled out and countersunk all of the necessary holes, including four new ones to move the lower screws that hold the slider supports in place. They had to be moved 3mm in, so I moved them diagonally to avoid weakening the frame. The slider bar supports are made of mahogany with brass inserts. To move them in the necessary 3mm I cut thin strips of 3mm plywood and glued these into the existing rebate with aliphatic resin, but any good PVA will do the trick. 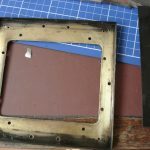 Then I primed and painted the brass tray with the new plastic shim, and the enhanced supports. Re-glue the felt onto the base of the tray (cutting 4 new holes where the new screws go), and reassemble the base and rotating components. 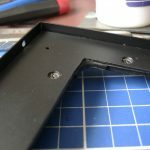 Screw the slider supports back in using the same screws, and reassemble the whole caboodle. The last thing to do is to shim the ground glass and fresnel assembly. I just used two thin strips of the same 1mm styrene, as this was the only change in the focal distance made. And now I have a Super D which can take all manner of film holders, including Fidelity double darkslides, as they are grooved on the side so they can be gripped by the sliders.